Vibrant, colorful veggie soup. Taste the difference. It's still soup weather here in northern New Mexico , so certain individuals lugged out their Crock Pot this week and pondered the gentle, slow art of vegetarian potage. 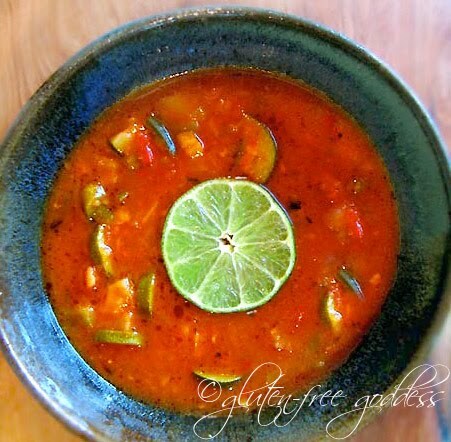 This new soup recipe is fresh tasting and full of flavor, kicked up with spicy green chiles a generous squeeze of lime. By the time the March winds howl I am craving a lighter, leaner soup chock full of fresh vegetables and laced with citrus. I added plenty of hot red pepper flakes to jazz it up, too. Sometimes a flexitarian goddess just needs to spice things up a little, vegan style. Bland is so old school. Drizzle a tablespoon or two of olive oil in in the bottom of a Crock Pot or slow cooker and toss in the chopped garlic, red onion and fresh vegetables. Add the diced tomatoes and roasted green chiles. Stir to mix. Pour in enough broth to cover the veggies by an inch of liquid. Season with fresh herbs, sea salt, ground pepper, and red pepper flakes (to taste- these are hot). Cover and cook according to your manufacturer's instructions for vegetable soup. Taste test for flavor adjustments and add a drizzle of agave and the juice of a fresh lime; taste, stir and warm through. Serve with a slice of my Sweet Potato Cornbread. Add a can of drained northern white beans or chick peas for protein. Make this easy soup on the stove top using a large soup pot . Follow the basic directions above; cover and simmer until the veggies are tender, about 25 minutes.